Utmost hygiene in connection with maintenance minimisation is the focus of the packaging industry. This maxim often poses enormous challenges, since the packaging machines - which are today faster and more productive than ever - are in continuous operation all along their required service time. But, in spite of the intensive machine running times, neither dirt accumulation nor dust generation is allowed at whatever location of the plant. The used components must be absolutely hygienic, they must resist dust and other deposits and operate with highest reliability almost without maintenance. Thanks to its smooth and straight surface - without any undercut - this slip ring is also very easy to service and can be cleaned with a damp cloth or with flowing water. The IP64 protection level also withstands a strong water jet. New contact materials, silver/bronze and silver/precious metal, the "Porsche" among the materials, guarantee cleaning totally without oiling. Simple vacuum cleaning is sufficient for this top quality material. Thys way, a large part of the often-deplored maintenance due to dusty or worn-out contact materials, which led in the past to expansive machine downtimes, is not necessary any more. With this new series of mobile and robust draw wire encoders, Kübler builds a bridge between price and performance. With their wires out of stainless steel, the new draw wire encoders A30, A41 and B75 allow absolute and incremental position measurement; depending on the model, they are designed for measuring lengths between 0.6 and 3 metres, with speeds between 0.8 and 1 metre per second. Especially intended for applications in mobile automation, conveyors technology, woodworking machinery or municipal vehicles, these linear sensors show all the required robustness for reliable and long-lasting operation. The draw wire encoders are available in various models and measuring lengths, with variable installation possibilities. Their very simple, space-saving installation and their robust construction in a sturdy zinc die-cast housing make these draw wire encoders the basic solution for a wide range of length, travel and position measuring tasks. 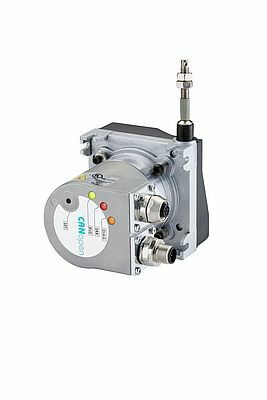 These new systems are available with analogue sensors, incremental or absolute encoders.